Was all of that really necessary? I still eat the occasional sardine, and an ordinary table fork gets the job done. But I’m willing to bet that if I ever tried an actual sardine fork, I’d immediately realize the advantages of doing so. If I ever needed to ladle out oysters, I’ll bet an oyster ladle would be the perfect tool for the job. Every editor I know uses Microsoft Word. It’s the standard solution, the default program, the accepted tool for word processing. But is it the best tool for editing? Out of the box, it’s not. It has too many features that editors don’t need, and they’re always getting in the way. When you’re editing, how often do you use SmartArt? How about WordArt? Page color? No? Then why not get rid of them? Why not turn Word into a lean, mean, editing machine? You can do this by customizing Word’s Ribbon. To do so, click File > Options > Customize Ribbon. So far, we’ve been removing whole groups of features at once, but you can also remove individual items from a group—if they are items you’ve previously added. Unfortunately Microsoft won’t let you remove the individual default features they think you need to have. The other problem with Microsoft Word is that it doesn’t have enough of the tools that editors need—at least not by default. Here again, the solution is to customize the Ribbon. 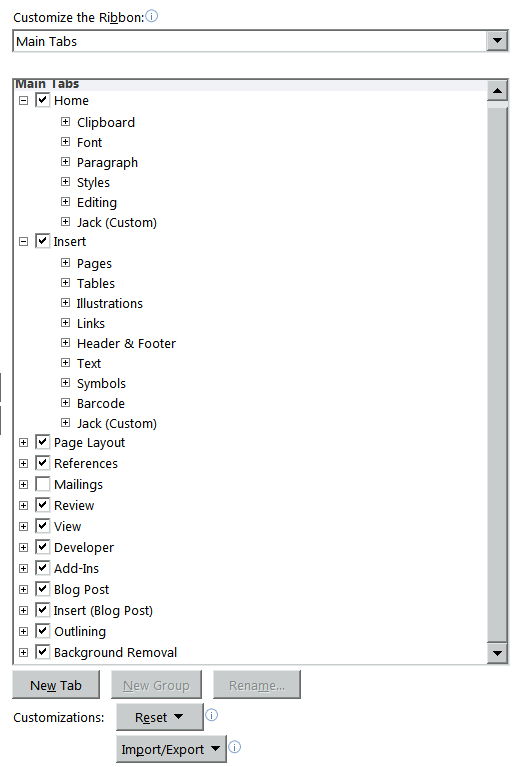 Again, click File > Options > Customize Ribbon. This time, look at the window on the left. In the top dropdown box, select “Commands Not in the Ribbon.” Very interesting! 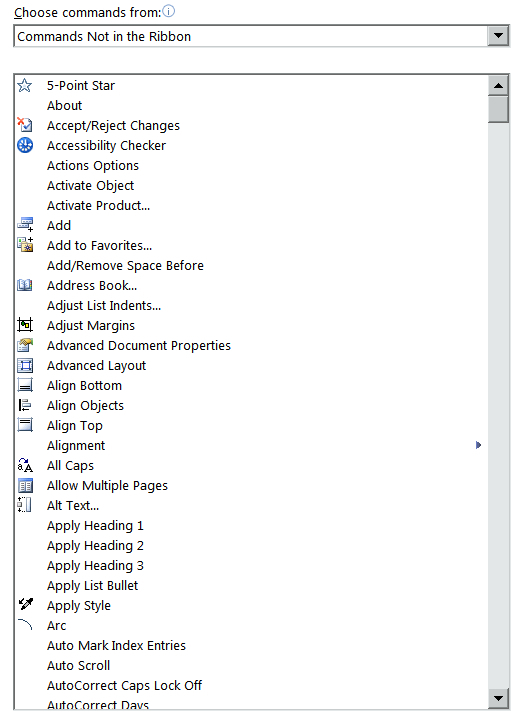 Using the buttons in the window, you can add these features to the groups of your choice on Word’s Ribbon. You can even add your own custom tabs and groups by clicking the buttons labeled “New Tab” and “New Group.” How about adding a tab called something like “Editing Tools,” with all of the features you need for editing? If you’re also a writer, you could add a tab called “Writing Tools.” Some of the features would be different; some of the features would be the same. There’s nothing wrong with having certain features duplicated between tabs or groups, if that makes your work easier. You can select other features by clicking the dropdown list and selecting “All Commands.” You can even select macros and add them to the Ribbon. Unfortunately, even with the wealth of features that Word provides, there are other editing tools that Word doesn’t provide. For example, how often do you need to transpose two words? Two characters? How much time do you spend lowercasing articles and prepositions in titles? How often do you have to reach for the mouse in order to apply a style? This is where add-in programs come in. “What’s an add-in program?” you ask. An add-in program is a Microsoft Word template that includes custom macros, Ribbon items, and keyboard shortcuts created specifically for a particular task—kind of like those Victorian utensils. As the name suggests, an add-in isn’t an independent piece of software; it actually works inside Microsoft Word, adding new features that then seem to be an integral part of Word. This isn’t some kind of hack, by the way; Microsoft Word was designed to support such add-ins, which is what makes them possible. I’m partial to my own add-ins, of course, the ones I sell on the Editorium website. 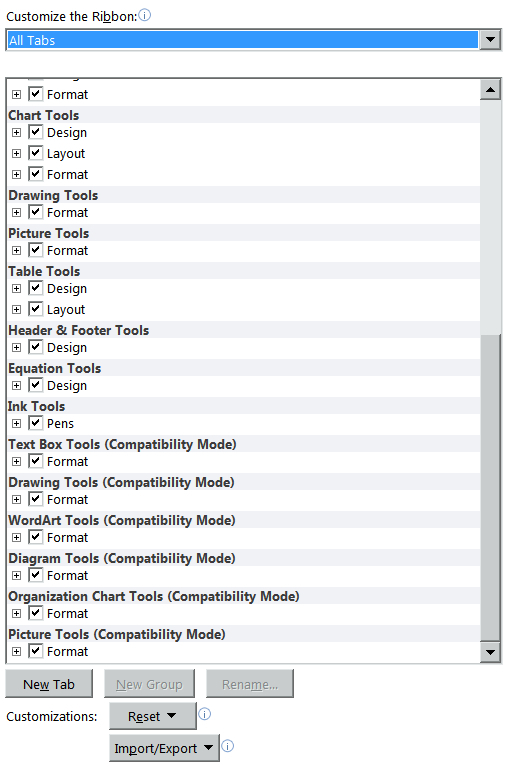 I’m really an editor, not a programmer, and I created these add-ins to make my own work easier. But I think you might like them too. If I want to transpose two words, I put my cursor anywhere in the second word and press the F11 key. To transpose two characters, I press F12. Rather than reaching for the mouse to apply a style, I press F5, which puts all of the styles at my fingertips. And as they say on television, there’s much, much more! All of these are small things, but those small things add up to big savings in time. And when you’re editing for a living, time is money. So how much is an add-in actually worth? If it saves you an hour on a single project, it’s probably paid for itself. On the next project, it pays for itself again. And on and on, into the future. Seldom does such a small investment reap such big rewards. Yes, this is a sales pitch, but I genuinely want you to succeed. That’s why I promote other add-ins like Rich Adin’s EditTools and Daniel Heuman’s PerfectIt. These tools can make a real difference in how efficiently you work and how much money you can make. With that in mind, why not get them all, at a very special price? Don’t think of these tools as an expense; think of them as an investment. Then the next time you need an editing tool, you’ll have it—and it will be the right tool for the job. Instead of dishing out tomato slices with a fork, you can use a tomato spoon! Instead of picking up bacon with your fingers, you can use a bacon fork! Using the right tool for the job makes all the difference in the world. I love editing! That always surprises me a bit, because I think of myself as a writer first and foremost, and I certainly started my professional life as a writer. If I had to choose between being a writer and being an editor, I’d probably choose writing — after all, my slogan is “I can write about anything!”® and my website is writerruth.com — but I’m glad that I don’t have to choose. Writing is creating. When I write something, I’m making something new — a new product, a new piece of information. What I write is unique, because no one else has exactly the same experiences, perspectives, research input, and voice as I do. I can put myself into what I write, as well as the essence of whoever or whatever I’m writing about, either invisibly through my writing voice or more obviously — when and where appropriate — by including my opinions or experiences. Editing is fixing, revising, changing, (ideally) improving, correcting, (sometimes) enhancing. It isn’t creating something new, although it is adding new elements to someone else’s written creation. It’s a partnership. There is something fulfilling, on a different level, in helping a colleague or client hone a piece of writing work until it communicates clearly and concisely what that person had in mind. Even if all I do is catch one egregious typo or dangling modifier, I contribute as an editor to the quality of other people’s work and to their ability to get messages across effectively. That feels great. Editing and proofreading the works of other people has had a positive effect on my writing, by making me more careful and thorough in what I create and how it reaches a client. Being a writer has made me a better editor and proofreader, by making me more sensitive to how a client might respond to my changes or comments, and sometimes by understanding how someone might have come up with something I suggest changing. I learned to be fairly objective about my writing work and to appreciate being edited from a tough, demanding, but very fair high school English teacher, first in her “Critical Reading and Writing” class and then in her Advanced Placement English class. Through her teaching and critiquing approaches, I developed stronger skills in recognizing and fixing structural problems, inconsistency, disorganization, and basic errors. Even though I didn’t think of becoming an editor at that stage of life, I started realizing that writing, even writing well, isn’t enough; editing is essential to crafting work that readers will understand, appreciate, even act upon. I started editing informally, noticing and fixing errors as I typed papers for classmates in college. When I joined the newspaper staff at my second college, I became part of a small group of colleagues who were passionate about writing and cared about quality in what we published, but had little training in editing. We were at a school that didn’t have a journalism program, so we were pretty much on our own for all aspects of putting the newspaper together. I learned about hands-on editing by being named editor of the arts page, even though I still thought of myself primarily as a writer. I managed to incorporate writing and editing into early jobs in community relations until I fell into a wonderful reporting job with a weekly newspaper — wonderful because of the variety and scope of what I could write about, and because of the additional responsibilities I could take on. No one had any real professional training, so I got involved with editing and proofreading as well as writing because I was the one who cared the most about quality as well as content and who had the best editing or proofreading skills. I found that I enjoyed all three activities. Being able to do all of them meant I had more future opportunities, even if at primarily smaller organizations. Bigger companies and publications tend to “compartmentalize” activities more than smaller ones — a writer is a writer, an editor is an editor, a proofreader is a proofreader, and ne’er the three shall combine. Time has brought me to a point where my freelance work is a satisfying combination of writing, editing, and proofreading, along with the occasional presentation. If I weren’t doing the editing and proofreading, I’d have to work harder at finding more writing work, so developing my editing and proofreading skills may have reduced the amount of writing I do, but I can live with that tradeoff. Going from in-house to freelance has meant even greater opportunities to apply writing, editing, and proofreading skills to an increasingly wide range of projects, topics, and clients. And to continually develop and improve those skills as well — over the years, I’ve found ways to enhance my editing instincts and skills more formally. As I embark on the new year, I’ll be looking for new projects in both writing and editing. Oh, and proofreading, too. The prospect of continuing to combine these communications skills is an exciting one. I’m very lucky to still feel such excitement about my work after all these years — which may well be a topic for another column here. On January 7 terrorists attacked the offices of the French satire magazine Charlie Hebdo and killed 12 people. At the same time and in support of the Hebdo murders, people were murdered at a Jewish grocery in Paris. The attacks and the killings were unjustified and unjustifiable. But then, I think, so were the deliberate taunts of Muslims by Hebdo unjustified and unjustifiable. We give credence to the slogan “freedom of speech,” yet seem incapable of understanding how anyone could possibly react as the terrorists did or justify that reaction to the publication of the cartoons by Charlie Hebdo. What I found disturbing in the aftermath of the murders is the narrowness of the protests and the one-sided assigning of blame. I also find the hypocrisy of the protestors disheartening and not understandable. In addition, I find reprehensible Hebdo’s followup “response” (the cover of the aftermath issue of Charlie Hebdo) and Hebdo’s unwillingness to acknowledge or accept any responsibility for what occurred — both in its own offices and in the Jewish grocery — as well as the unwillingness of society to say that Hebdo shares responsibility. On the forums on which Hebdo was discussed and of which I am a member, the near universal spoken belief was that Hebdo had no responsibility for what occurred. I think that is simply a reflection of prejudice against, in this instance, Islam. Hebdo knew or should have known that publishing cartoons that insult the Prophet Mohammed will incite some Muslims to violence. It does not matter whether such a reaction is justified, just that any reasonably intelligent person would have predicted/expected such a reaction. It is not as if this has not occurred before. And when Hebdo had done similar “satire” in the past, it was attacked, resulting in some staffers being given police protection (one of the Hebdo dead was a bodyguard). Living in a society involves reciprocal obligations. That is the basis for our interrelationships. We have simply delegated responsibility for enforcing those reciprocal obligations to a judicial system, but that does not change the underlying obligations. Yet in the Hebdo instance, it appears as if most people and Hebdo itself believe that Hebdo had no obligation to Muslims (not to insult), only that Muslims had an obligation to Hebdo (not to react, especially violently, to any insult). Without in any way approving of the terrorists’ reaction, I am of the belief that Hebdo acted knowingly recklessly. I think Hebdo expected a reaction like what occurred except that it expected the reaction to occur somewhere else and to someone else. It is not as if Hebdo had not previously made whatever point it was trying to make; it had mocked Islam before. This lack of willingness to accept responsibility is shored up in my view by the cover cartoon of the first issue after the massacre and the publication run size — 100 times the normal print run. The response to the followup cover was to be expected — the threat of more attacks to come. I am not Charlie because I cannot endorse reckless behavior for which the consequences are known yet the perpetrator is unwilling to acknowledge or accept any responsibility. With freedom of speech comes the obligation to accept responsibility for the consequences of its use. And isn’t it interesting that the march was for Hebdo’s right to publish insults, but there was no similar march protesting the anti-Semitism that has been on the rise in France or the Islamophobia that has gained currency, including the attacks on mosques, in France. Many French have painted all Muslims with the same broad strokes, even though the vast majority of Muslims do not condone the terrorist acts. Perhaps even more interesting, at least to me, was how Charlie Hebdo came into being. It seems that it came into being partly as a response to its predecessor title having been shut down by a French government ban. Where were the marches in protest then? News media have reported that Jews are thinking of emigrating from France because of the anti-Semitism (and let us not forget that the Jews who were killed in the kosher grocery were buried in Israel, not in their French homeland). Where was the solidarity with the Jews? Where was the outrage for those who were murdered in the kosher grocery as part of the Hebdo attack? Or the outrage for the attacks on synagogues? Much of the hypocrisy lies in the idea that freedom of speech for those who are favored is different than the freedom of speech that is for those who are disfavored. Hebdo is lauded for insulting Islam and is under no obligation to accept any responsibility for its provocations. But the insulted Muslims are expected to accept the insults quietly, just brush them off as one commentator suggested. To my thinking, what Hebdo really illustrates is a failure of the social compact. The social compact has always been that of reciprocity: I respect you and you respect me. But that is not the Hebdo compact. The Hebdo compact is: You respect me and I disrespect you. There is no reciprocal obligation. Society survives only when there is reciprocity. When people are unwilling to accept responsibility for their actions, chaos ensues. A simple illustration is driving: When we all abide by the rules of the road, such as stopping for a red light, society thrives. But if just a small percent of people take the view that I have to follow those rules but they do not, chaos on the roads ensues. Religion has always been a harbinger of social chaos because every religion is based on the core idea that it is the one true religion and all others are blasphemous. And where the fundamental rule of reciprocity fails, religious wars — covert or overt — persist. Those wars may not always be overtly violent, but they are suppressive. In the West, we have made, since World War II, the maintenance of society a core value. Consequently, following World War II, until recent years, reciprocal religious respect has been the rule. Hebdo is evidence of the breakdown of that rule because the “I am Charlie” movement supports the “freedom” to disrespect others without any responsibility for the results of that disrespect. This is not to say that Hebdo should not have been permitted to publish what it wanted. Rather, it is to say that Hebdo should be obligated to accept responsibility for the consequences of its decision to do so. It is also to say that we should not accept “freedom of speech” that is freedom only for those with whom we agree; the real test of freedom of speech — or of any freedom — is whether we give it to those with whom we disagree. others the respect we want given us. So you’ve completed the first-pass read-through of the manuscript. Now you’re ready to get into the thick of things and do your main-pass edit. Let’s get to it! Of course, as for a nonfiction copyedit, you will compile a style sheet. If a style sheet is available from a previous book by that author or a previous book in the series, use that as your starting point. (See my essay, “The First Pass — Just Read It!,” for more on reviewing previous style sheets.) I actually maintain four style sheets (general style, characters, places, and timeline) for each fiction edit for ease of navigation, although if you would like to combine the four sections I use into one document, go right ahead. Or you can keep them separate and combine them into one document when the edit is finished. Over the next four essays I will discuss the style sheets I keep in a little more detail. Most of the time in fiction, numbers will be spelled out, especially in dialogue, but as always there are exceptions. Phone numbers (particularly 911, the emergency number), years, decimals, vehicle designations (such as aircraft call signs), and weapon names (AK-47) and calibers are usually presented in digits. In general, use digits for numbers that would become unwieldy if spelled out. Common entries on my style sheet include heights (five-foot-one, six four), time (eight thirty, 6:27 a.m.), highway numbers (Route 28, the 101), decades (the seventies), clothing sizes (size eight) and room numbers (room 307). (The examples I’ve given here are just that — examples — rather than rules about how to style these. Again, each book might use a different style, with house style and author preference as factors.) I’ll delve into numbers in more detail in a future article. This is also a good place to note unusual punctuation used in dialogue: ’cause, ag’in, I’mma. Direct thought, indirect thought, imagined dialogue, mouthed dialogue, remembered speech, telepathic dialogue, words as words or sounds, letters as letters or shapes or academic grades, signs, handwriting, text messages, e-mails, typed text, computer commands, foreign terms: these can be treated in many different ways. Italic? Small caps? Caps and small caps? A special character style in the client’s template? Roman, in quotation marks? All caps? Initial caps? Title case? Note it here. A common consideration in fiction is how to treat terms of address and epithets. Generally, generic terms used to address someone that are not an established nickname for that person are lowercased: sweetheart, pumpkin, my dear, ma’am, jerkface. Occupational titles used in place of a name are often capped (but not always! ): Doctor, Officer, Lieutenant. The same is true for temporary epithets: Mr. Wonderful, Crazy Homeless Guy. Note any firm usage preferences here: whether to distinguish between that/which, further/farther, each other/one another, and the like. (These would usually apply mainly to omniscient narrative, as first-person narrative and dialogue are frequently left as is rather than conformed to “correct” usage, unless the character would be expected to use it.) An excellent usage reference is Garner’s Modern American Usage. Ah, “Miscellaneous,” the junk drawer of the style sheet. In fiction I use this primarily for terms that don’t fit in other places: fictional and real items such as organization names, publications, historical events, special terms such as magical commands, and so on. The word list is pretty much the same as for nonfiction, with some additions. Here I note any British spellings and foreign terms, treatment of slang terms (dammit or damn it?) trademarks (real or fictional), sounds and interjections (uh-huh, uh-oh, for gosh sakes), and so on, as well as the usual sorts of terms one might include on a nonfiction word list. I also note any variants from dictionary spellings that the author may prefer (again, with the “(au pref)” label). In invented worlds, such as in fantasy novels, unconventional capping is much more prevalent: the Sight, She (referring to an exalted character), Before (referring to an earlier era). The word list is a good place to note terms such as these. In coming essays, I’ll delve into each of these areas in more detail. Hopefully, this article has given you a good overview. Next month: tracking character attributes. I know many of you do not read BusinessWeek, so I thought I would bring this to your attention. This has nothing to do with editing or any editorial service; instead, it has to do with potentially good deals for us as consumers. Everyone thinks of Amazon when it comes to low prices and great customer service. For customer service, Amazon has become the benchmark. As many of you know, I am not a fan of Amazon because of the way it conducts business with vendors and competitors, particularly in the book world, which is my business world. So I avoid buying from Amazon whenever possible; I am even willing to pay a bit more to support an Amazon competitor. Whether it will ultimately prevail or succeed, I have no idea, but I will check out Jet.com when it opens for business in March. It will especially be nice if I can get office supplies more cheaply. The one thing, aside from my being a professional editor and not just an editor, that I like to think I am is bias-free. Of course, that is more wishful thinking than reality. Reality runs more like this: Every editor is biased. The important question is: Do I recognize my biases? If I do not recognize my biases, I fail to provide the quality and level of service my client pays me for. Which raises another question: Is there a relationship between bias control and fee being earned? That is, is a high-paying client entitled to greater effort on my part to control my biases than is a low-paying client? From the beginning — every editor is biased. We have subject-matter biases, client biases, and editorial biases, among a world of other biases. Client and subject-matter biases are easily dealt with: we simply do not (hopefully) undertake projects in areas we abhor or from clients we cannot stand. For most of us, the problematic area is editorial biases. One of my editorial biases is “due to.” How I hate that phrase. Yes, it does have a proper place and use, and then it should be crowned king. But authors use “due to” to mean so many different things that it has come to represent the sign of a lazy author. The author may be brilliant — a genius in the field — but the author who uses due to as a substitute is lazy. And to my way of thinking, the editor who (speaking nonfiction, not fiction) doesn’t try to replace the vagueness of “due to” with the more precise and accurate term it is substituting for is even lazier than the author. There are at least 20 alternatives for “due to” and each alternative carries important connotations and levels of precision. The point is that I know I have a bias against the use of “due to” and instead want more precise language used so that the reader does not have to guess at which alternative is meant. I also prefer precision in time; I have a time bias. For example, I dislike when an author writes “in recent years” or “in the past 20 years.” Using this type of time reference allows the time to shift. The shift occurs because the reference was made when the author was writing the sentence, which could have been 5 years ago or 2 days ago, but doesn’t allow for the passage of time since the writing of those words, or for the editing and production time until publication, or for the book’s expected several-year shelf-life. There are other words I have a bias against, such as “since” as a substitute for “because” and “about” as a substitute for “approximately.” Many of us also have biases when it comes to hyphenation (is it “co-author” or “coauthor”? “copy-edit” or “copyedit”?). I am aware of my biases and try to be judicious in my application of the biases. Where it doesn’t affect understanding or meaning, I weigh whether or not to act on my bias. Quite often that decision is made based on the subject matter and complexity of the book I am editing. Yet, there is one more constraint on the exercise of my biases: Can I justify my decision to act/not act? Justification does not include “I like it better” or “It looks better to me.” Clearly, “due to” is liked better and looks better to the author. My justification for changing “due to” is grounded in clarity/precision versus vagueness/imprecision. I asked earlier if there is a relationship between my control of my biases and the fee paid by the client. The answer is “no.” Regardless of how much I am being paid, I should always control my biases because my role is to help the author, not substitute for the author. From an ethical perspective, “no” is the only correct answer. For colleagues who do not view these things as editorial biases, the question does not arise. It only arises for those of us who take the time to consider whether “since” is being used to convey a sense of time or as a substitute for “because.” It becomes an issue for us because the longer we take in deciding what “due to” is substituting for, the less money we will earn if we are on a per-page or project fee rather than an hourly basis. Although in today’s English “since” and “because” are considered synonymous, I adhere to the rule that “since” is used to express the passage of time, as in “since 2000,” and the terms are not synonymous. I adhere to this rule because I believe it makes your meaning both clearer and more precise, and considering the subject matter, clarity and precision are important tools for ensuring there is no miscommunication between you and your reader. Do you recognize your editorial biases? How do you deal with them? Wrong and right aren’t words I’m particularly comfortable with when it comes to marketing, given how many different approaches we can take. Nevertheless, there are four basic mistakes that should be avoided when launching an editorial business. Let’s say that I’ve completed the relevant training, acquired the kit I need, worked out who my target clients are, notified the tax authorities of my business plans, acquired some experience via my mentor, designed my stationery templates, created my accounting spreadsheet, and hired a professional designer to produce a fabulous logo. Now I need the clients. That means they need to be able to find me and I need to be able to find them. If ne’er the twain meet, I’m unemployed. Being discoverable is the first step to the success of any business, editorial or otherwise, because it bridges the gap between the services we offer and the people who need them. The second step is being interesting enough to retain the potential customer’s attention. Having found us, our potential clients need to feel they want to go further and actually hire us to solve their problems. If you’re an inexperienced marketer, and feel nervous about the process, take a look at the marketing archive on my blog, The Proofreader’s Parlour; look at Rich Adin’s marketing archive here on An American Editor; explore KOKEdit’s Copyeditors’ Knowledge Base, especially the article Marketing Tips for Freelancers; and read my book Marketing Your Editing & Proofreading Business (there’s a sample marketing plan in the final section to guide you). No matter how much the thought of actively promoting your editorial business sends shivers up your spine, to not do so is a mistake. Marketing your business gives you opportunity and choice. It puts you in a position where, over time, you can develop the client base, pricing strategy, service portfolio and income stream that you require and desire. Relying on only one particular channel to make yourself discoverable to your customers is better than not doing any marketing at all. But it’s hugely risky—if that platform fails, so do you. One of my most valuable marketing assets is my website. It’s my shop front and it’s the only space in which I have complete control over the content and design. I’ve put a lot of effort into SEO so I rank highly in the search engines. I use Weebly as my host. But what if the folks at Weebly ran into some horrendous problem and the site was inaccessible for a few days, or even a few weeks? It’s unlikely to happen, but even if it did it wouldn’t be catastrophic because I don’t rely solely on my website for work leads. It’s simply one tool among several. Another scenario is more likely. Imagine I used to work for a major academic publisher. Now that I’ve launched my new editorial business, I ask a former colleague who works in the journal production department if I can proofread for them. They agree. The publisher has a huge journal list and my colleague keeps me busy with as much proofreading as I need. I don’t solely work for this press (here in the UK, HM Revenue & Customs wouldn’t like that) but it the provider of my primary income stream. Then double disaster strikes — the press merges with a competitor, and my colleague is made redundant. He gets a job for another press, though his new role no longer requires him to hire editorial freelancers. I don’t know anyone in the newly merged organization (though rumor has it they’re taking journal proofreading in-house in order to cut costs) and my colleague can’t take me with him to his new press. I’m scuppered. Even if you’ve been able to establish a couple of apparently stable and lucrative work streams, and you’ve found that one particular marketing platform or tool works well for you, take the time to investigate other channels. At the very least they’ll provide you with a backup. Moreover, by experimenting with new avenues, you may find that customers whom you’d been invisible to beforehand are now placing you on their radar. That means more opportunities and more choices. Some new entrants to the field can make the mistake of giving information that focuses potential clients’ attention in the wrong place. Focus on stand-out statements: Imagine a well-educated material scientist who’s decided, for health reasons, to move out of the professional lab and work from home, copy-editing written materials relevant to his scientific educational and career background. If what you say doesn’t sell your business in a way that makes you interesting, recast your message. If you lack experience and an extensive portfolio, focus instead on positive selling points that make the customer feel confident about hiring you to solve their problems. Our message needs to focus on the skills we have to offer, not those we’ve yet to acquire. Sell your positives, not others’ negatives: It’s also imperative that your message does indeed focus on what you have to offer. Just case you are one of the few people on the planet who thinks that focusing on a competitor’s or colleague’s mishaps rather than your own skills is a good marketing strategy (I’m sure you’re not! ), then this is a quick reminder that it’s disastrous in terms of PR. Why? Pointing out a competitor’s foibles focuses the client’s attention on the competitor’s business rather than your own. Such an approach destroys integrity, which leads to a lack of trust. And if they don’t trust you, they won’t hire you. We need to make ourselves interesting and visible rather than trying to make our competitors look incompetent and unworthy of discovery. Before Tim Berners-Lee invented the World Wide Web in 1989, editorial professionals had to promote their businesses using telephone and postal services, face-to-face meetings, and onsite networking groups. These methods worked then, and they still work now—don’t make the mistake of ignoring them in the belief that they’re out-dated. Social media profiles, websites, and emails are all excellent and immediate ways to make yourself discoverable. However, from the client’s point of view they are as easy to discard as they are to access, precisely because they are digital methods of contact. A cleverly designed postcard can be tacked onto a wall; a targeted CV and covering letter can be read anywhere, even if there’s no internet connection, and held on file; a well-thought-out gift pack will be appreciated, talked about and used; and a business card can all be retained in a wallet, purse or card deck. I’ve addressed in more detail the benefits of letter writing on the SfEP blog (“Don’t forget the “old” ways: marketing via letter writing“), and I’ve discussed custom card-giving here on AAE (“The Proofreader’s Corner: Giving Your Business Promotion the Personal Touch“). See also Rich Adin’s “The Business of Editing: Thinking Holidays“, an excellent guide to gifting. Balancing immediacy and permanence is key to a well-rounded marketing strategy. By using a mixture of the two, you will enhance your visibility and spike your customer’s interest. Even if you’re nervous about the idea of actively promoting your business, don’t avoid it—make yourself discoverable to your clients so that, over time, you provide yourself with opportunities and choice. Use a variety of channels to cover your back. That way you’ll minimize the chances of unexpectedly, and through no fault of your own, being without a work stream. Make yourself interesting to your clients by drawing their attention to your business—the key skills and knowledge that you possess to help them solve their problems; the things about you that differentiate you, that make you stand out. Use a combination of traditional and digital marketing tools so that your promotional campaigns have both immediacy and permanence. A bit more than a year ago, I wrote about my experience with ransomware in “Business of Editing: URLs, Authors, & Viruses.” A week later, I followed it up with “Articles Worth Reading: More on Ransomware.” And just a few weeks ago, I wrote “The Business of Editing: Playing It Safe” in which I discussed Sandboxie. The installation components of CryptoWall 2.0 are cloaked by multiple levels of encryption, with three distinct stages of installation each using a different encryption method to disguise the components installed. And like many modern pieces of malware, CryptoWall 2.0 has a virtual machine check in its code that disables the attack when the malware is installed within a virtual instance—in part to prevent security researchers from isolating and analyzing its behavior. The VM checker code, in the first stage of CryptoWall’s dropper sequence, checks the system for running processes, searching for VMware and VirtualBox services or the Sandboxie application partitioning library. If the coast is clear, the code does some best practices-based memory handling to release memory used in the initial drop mode, then launches another dropper disguised as a Windows Explorer process. Note that before it tries to install itself, CryptoWall searches for a running process like Sandboxie. If it finds Sandboxie (or similar software) running, it doesn’t go any further; if it doesn’t find Sandboxie running, it proceeds to the next installation step. I think the price is cheap for the protection it affords. And contrary to popular belief, your antivirus and malware programs do not protect against ransomware. Although ransomware exploits holes in the operating system, it does not attack the operating system, which is what antivirus and malware programs protect against; ransomware attacks your data files — your Word documents, your text files, your picture files, and the like — by encrypting them, not destroying them. If you haven’t yet checked out a program like Sandboxie, I encourage you to do so. My wife came across the following video and it is a very powerful statement of the wrong lessons we are taught by society. Other than urging you to watch and listen, nothing more needs to be said except kudos to these three teenagers.